Uh oh, trouble for Johnny Depp's Notorious BIG crime drama, City of Lies? The film, which co-stars Forest Whitaker, was to open on September 7th, the 46th birthday of the slain rap legend. But instead, distributor Global Road have yanked it from the schedule without giving it a new date. No reason was given for the move, and it's unclear if they'll look for a digital release or aim for a later theatrical date. The film is directed by The Lincoln Lawyer's Brad Furman, and centers on the investigation into Notorious B.I.G. 's 1997 murder, which goes unsolved. 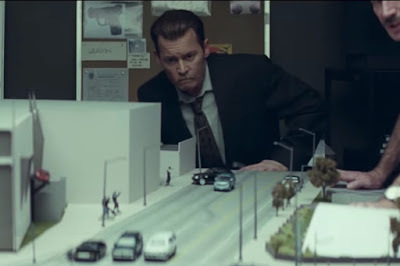 It's based on Randall Sullivan's book, LAbyrinth: A Detective Investigates the Murders of Tupac Shakur and Notorious B.I.G., the Implication of Death Row Records’ Suge Knight, and the Origins of the Los Angeles Police Scandal, and would star Depp as real-life LAPD detective Russell Poole. The move comes a month after Depp's former location manager sued him for assault, alleging the actor punched him twice on set after being told filming would run late. He also claims to have been wrongfully fired for refusing to sign a non-disclosure agreement, and is seeking damages of an unspecified amount.